It's rather chilly out so I looked through my blog for a photo to use as inspiration. The image I chose was part of a post entitled Aiming Past the Wood back in October of 2010. It's hard to believe I've been blogging for nearly four years. Wow! I remember photographing this scene the day the huz taught our son to split wood. They set the axes aside to take a break just before I walked up with the camera. Okay, so I probably could have worked outside today...it wasn't that cold. In fact, my friends on the east coast and in Canada would think me a bit if a wimp (and rightly so) if they knew the high was about 50 degrees Fahrenheit, so please don't tell them. When I see a winter scene I know was painted en plein air, I am in awe. 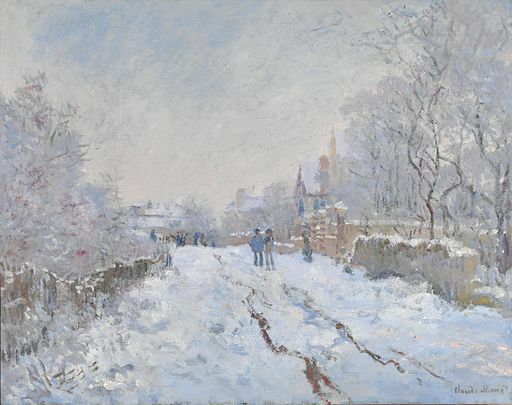 Can you imagine trying to draw or paint while standing on a snowy road? This attitude reveals a real lack of passion on my part, I suppose. Ideally I would like to sketch only from life but I do find that working from a photograph helps me see spatial relationships of objects to each other and to the frame a little better. The camera has already done the work of turning the subject into a two dimensional image. It's a bit of a crutch but as I try to get back in the sketching groove I simply choose not to make things harder than they have to be. Photographs also come in handy when you want to experiment with composition a bit. This cropped image is a much more pleasing arrangement and it really emphasizes the main memory attached to the drawing. 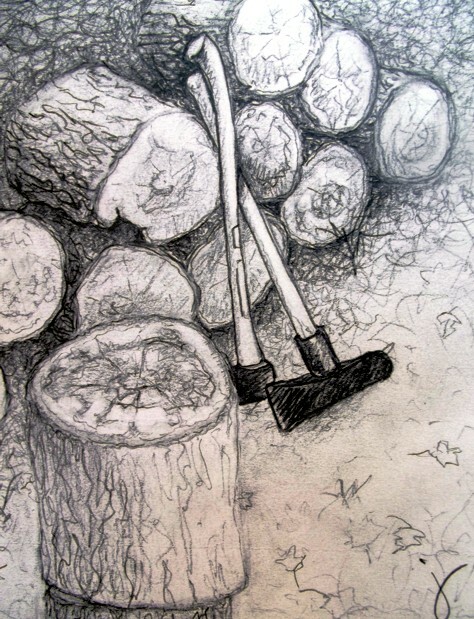 So this isn't a sketch of something that's a part of my world on this day, but chopping wood has definitely been a very big part of our lives since we moved to East Texas. During our first eighteen years here we heated our home exclusively with a wood stove. This only made sense because: a.) we were young and energetic, b.) our winters here are mild, and c.) we were young and energetic. Nothing has changed much since then except that we are no longer young and energetic. Oh, it was all very romantic for a time...all that sacrifice and doing things the hard way but, quite frankly, I no longer (you guessed it) choose to make things harder than they have to be. wonderful drawing, is it strange that I see the axes dancing? Hello Janice I'm so happy to visit and see all you've been up to, quite a lot! I've missed lots of posts, so many lovely creations! 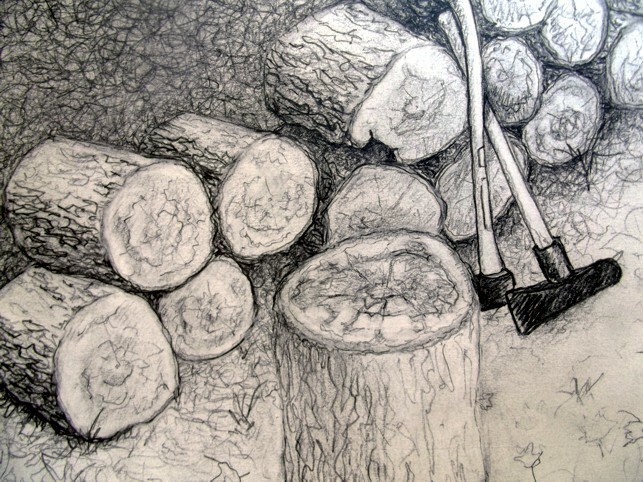 Your sketch is so well done, all those intricate lines making up the logs, great sketch! I don't know how the plein air people do it. I can't paint in mittens, but the blazing sun doesn't seem much better! I'm okay with being a wimp!! I need creature comforts. Your sketch looks great, I love the way you got the texture of the bark.